That might seem like a philosophical question, but it’s one that is very amenable to scientific inquiry. Stated a little more concretely, “Why is the universe made of the kinds of matter that makes human life possible so that we can even ask this question?” Scientists conducting research in Japan have announced a measurement last month that directly addresses that most fascinating of inquiries. It appears that their measurement disagrees with the simplest expectations of current theory and could well point toward an answer of this timeless question. Using the J-PARC accelerator, located in Tokai, Japan, scientists fired a beam of ghostly subatomic particles called neutrinos and their antimatter counterparts (antineutrinos) through the Earth to the Super Kamiokande experiment, located in Kamioka, also in Japan. This experiment, called T2K (Tokai to Kamiokande), is designed to determine why our universe is made of matter. A peculiar behavior exhibited by neutrinos, called neutrino oscillation, might shed some light on this very vexing problem. Asking why the universe is made of matter might sound like a peculiar question, but there is a very good reason that scientists are surprised by this. It’s because, in addition to knowing of the existence of matter, scientists also know of antimatter. However, that “into exactly equal amounts” phrase is the crux of the conundrum. In the brief moments immediately after the Big Bang, the universe was full of energy. As it expanded and cooled, that energy should have converted into equal parts matter and antimatter subatomic particles, which should be observable today. And yet our universe consists essentially entirely of matter. How can that be? By counting the number of atoms in the universe and comparing that with the amount of energy we see, scientists determined that “exactly equal” isn’t quite right. Somehow, when the universe was about a tenth of a trillionth of a second old, the laws of nature skewed ever-so-slightly in the direction of matter. For every 3,000,000,000 antimatter particles, there were 3,000,000,001 matter particles. The 3 billion matter particles and 3 billion antimatter particles combined — and annihilated back into energy, leaving the slight matter excess to make up the universe we see today. Thus, scientists have turned their attention to neutrinos, to see if their behavior can explain the excess matter. Neutrinos are the ghosts of the subatomic world. Interacting via only the weak nuclear force, they can pass through matter without interacting nearly at all. To give a sense of scale, neutrinos are most commonly created in nuclear reactions and the biggest nuclear reactor around is the Sun. To shield one’s self from half of the solar neutrinos would take a mass of solid lead about 5 light-years in depth. Neutrinos really don’t interact very much. The three kinds of neutrinos, called the electron neutrino, muon neutrino and tau neutrino, can “morph” into other types of neutrinos and back again. This behavior is called neutrino oscillation. Let’s consider this a little more fully, but in a simplified way: Suppose that there were only two neutrino types — muon and electron. Suppose further that you had a beam of purely muon type neutrinos. Neutrinos oscillate at a specific speed and, since they move near the speed of light, they oscillate as a function of distance from where they were created. Thus, a beam of pure muon neutrinos will look like a mix of muon and electron types at some distance, then purely electron types at another distance and then back to muon-only. Antimatter neutrinos do the same thing. However, if matter and antimatter neutrinos oscillate at slightly different rates, you’d expect that if you were a fixed distance from the point at which a beam of pure muon neutrinos or muon antineutrinos were created, then in the neutrino case you’d see one blend of muon and electron neutrinos, but in the antimatter neutrino case, you’d see a different blend of antimatter muon and electron neutrinos. The actual situation is complicated by the fact that there are three kinds of neutrinos and the oscillation depends on beam energy, but these are the big ideas. The observation of different oscillation frequencies by neutrinos and antineutrinos would be an important step towards understanding the fact that the universe is made of matter. It’s not the entire story, because additional new phenomena must also hold, but the difference between matter and antimatter neutrinos is necessary to explain why there is more matter in the universe. When T2K measured this variable, they found it was inconsistent with the hypothesis that neutrinos and antineutrinos oscillate identically. A little more technically, they determined a range of possible values for this variable. There is a 95 percent chance that the true value for that variable is within that range and only a 5 percent chance that the true variable is outside that range. The “no difference” hypothesis is outside the 95 percent range. In simpler terms, the current measurement suggests that neutrinos and antimatter neutrinos oscillate differently, although the certainty does not rise to the level to make a definitive claim. In fact, critics point out that measurements with this level of statistical significance should be viewed very, very skeptically. But it is certainly an enormously provocative initial result, and the world’s scientific community is extremely interested in seeing improved and more precise studies. The T2K experiment will continue to record additional data in hopes of making a definitive measurement, but it’s not the only game in town. At Fermilab, located outside Chicago, a similar experiment called NOvA is shooting both neutrinos and antimatter neutrinos to northern Minnesota, hoping to beat T2K to the punch. And, looking more to the future, Fermilab is working hard on what will be its flagship experiment, called DUNE (Deep Underground Neutrino Experiment), which will have far superior capabilities to study this important phenomenon. While the T2K result is not definitive and caution is warranted, it is certainly tantalizing. Given the enormity of the question of why our universe seems to have no appreciable antimatter, the world’s scientific community will avidly await further updates. 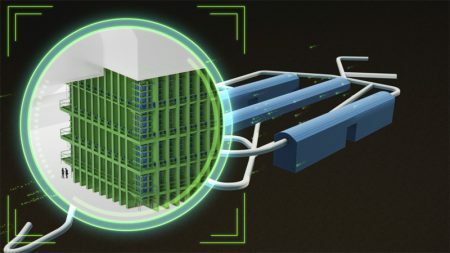 To investigate some of the biggest mysteries in the universe, particle physicists design and build high-tech detectors. On top of the incredible science they make possible, these experiments are often staggeringly beautiful. Views of the process of putting them together look like they could come straight out of a sci-fi film or from an alien planet. This is true of the ProtoDUNE detectors, which often appear in photographs as giant gold-colored cubes. These test beds are how scientists assess the technologies that will go into the Deep Underground Neutrino Experiment, the biggest international science project in the United States. Hosted by the US Department of Energy’s Fermi National Accelerator Laboratory, DUNE will send particles called neutrinos 800 miles (1300 kilometers) through the earth from Illinois to South Dakota. There, about a mile (1.5 kilometers) underground, the largest liquid-argon neutrino detector ever built will analyze how those neutrinos behave. Researchers will use the data to investigate some of the biggest unsolved mysteries in particle physics, including why matter exists and what role neutrinos played in the universe’s evolution. DUNE is an international endeavor with 1100 scientists and engineers from more than 30 countries. DUNE is supported by international funding agencies, including the DOE Office of Science. The prototype detectors for DUNE are under construction at the neutrino platform at CERN, the European Center for Nuclear Physics and home of another amazing science machine, the Large Hadron Collider. The two ProtoDUNE detectors will help finalize the two different technologies that will be used for the four modules that will comprise DUNE’s far detector and will be filled with 70,000 tons of liquid argon. Take a look at the construction and evolution of the two prototypes in these 20 photographs—and keep in mind that each of the final DUNE detector modules in South Dakota will be 20 times bigger. The first step in constructing the mammoth, cube-shaped ProtoDUNE detectors was to weld together portions of the steel cages, the red objects in this photo. Welders assemble parts of the steel cages for ProtoDUNE. This outer structure provides the necessary support for the interior membrane (or cryostat) that holds the liquid argon. Please see the full article for all 20 photos. The giant DUNE detector will record images of particle tracks created by neutrinos colliding with argon atoms. No image credit. To learn more about the Deep Underground Neutrino Experiment, the Long-Baseline Neutrino Facility that will house the experiment, and the PIP-II particle accelerator project at Fermilab that will power the neutrino beam for the experiment, visit http://www.fnal.gov/dune. Wenzhao Wei and Dan Rederth are the first to earn physics PhDs within the state of South Dakota. Completing a PhD in physics is hard. It’s even harder when you’re one of the first to do it not just at your university, but at any university in your entire state. That’s exactly the situation Wenzhao Wei and Dan Rederth found themselves in earlier this year, when completing their doctorates at the University of South Dakota and the South Dakota School of Mines and Technology, respectively. Wei and Rederth are graduates of a joint program between the two institutions. Wei found out just a few weeks before going in front of a committee at USD to defend her thesis. A couple of students ahead of her had dropped out of the PhD program, leaving her suddenly at the head of the pack. Despite her wariness, and with some significant publications in the field as the first author, Dr. Wei’s defense was successful, and she is now working as a postdoc at the University of South Dakota. Rederth knew he was the first at SDSMT but wasn’t aware it was a first in South Dakota until after he had handed in his dissertation and completed his defense. “The president of the school told me I was the first in South Dakota after I finished,” he says. “But I wasn’t aware that Wenzhao had also completed her PhD at the same time. His work involved studying strange magnetic quantum effects that arise when certain particles are confined in special materials. A computer program he developed to model the effects could help bring new technologies into electronics. For Wei’s success, you might expect she had also always made a beeline to research, but physics was actually a late calling for her. At Central China Normal University, she had studied computer science and only switched to physics at master’s level. Wei’s thesis, entitled “Advanced germanium detectors for rare event physics searches,” and her current research involve developing technologies for new kinds of particle physics detectors—ones that use germanium, a metal-like element similar to tin and silicon. Such detectors could be used for future neutrino and dark matter experiments. South Dakota is already home to a growing suite of physics experiments located a mile beneath the surface in the Sanford Underground Research Facility. It was in part a result of these experiments being located in the same state that Wei’s pioneering PhD program came about. USD has been involved with several experiments at SURF, among them the Deep Underground Neutrino Experiment, which will study neutrinos in a beam sent from Fermilab 1300 kilometers away. Post-doctorate, Wei is now continuing the research she began during her thesis. But with a twist. So where next for South Dakota’s first locally certified doctors of physics? Rederth, too, wants to help inspire the next generation. “I want to stay in the Black Hills area to help raise science and math proficiency in the local schools. I’ve been a judge for the local science fair and would like to become more involved,” he says. Perhaps some of their future students will go on to join the list of South Dakota’s physics doctorates, started by their trailblazing teachers. Last week, the Long-Baseline Neutrino Committee (LBNC) met at Sanford Lab. The committee consists of leading scientists from around the world who review the scientific, technical and managerial progress of the Long-Baseline Neutrino Facility and associated Deep Underground Neutrino Experiment (LBNF/DUNE). The committee meets three times each year in different locations; the previous meeting was held at CERN in Switzerland. In addition to attending meetings and writing reports, committee members toured Sanford Lab’s facilities, including the underground laboratories. 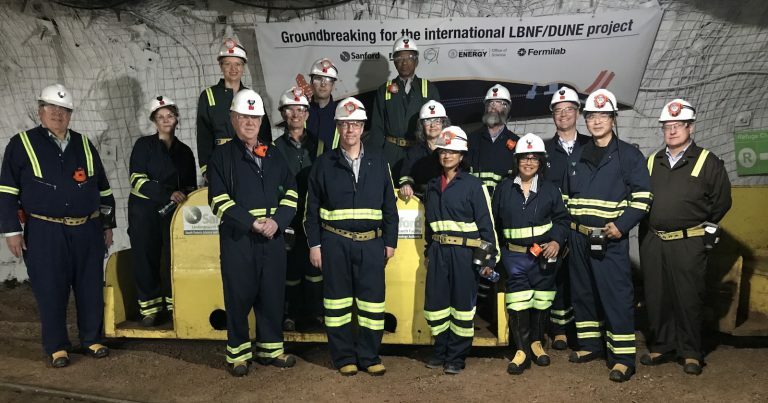 With more than 1,000 scientists from 176 institutions and 31 countries, LBNF/DUNE is the first international mega-science project to be hosted by a U.S. Department of Energy National Laboratory—Fermilab. The scientific collaboration hopes to revolutionize our understanding of the role neutrinos play in the creation of the universe. Using the Long-Baseline Neutrino Facility, they’ll shoot the world’s highest-intensity beam of neutrinos from Fermilab in Batavia, Illinois, 800 miles straight through the earth to huge detectors deep underground at Sanford Lab. The LBNC is analogous to the LHCC (Large Hadron Collider Committee) and has been in existence for two years. “That committee is a successful model that has been in place for more than 20 years,” Lockyer added. A sister committee, the Neutrino Cost Group, reviews the management schedule and costs of the project, Lockyer said. 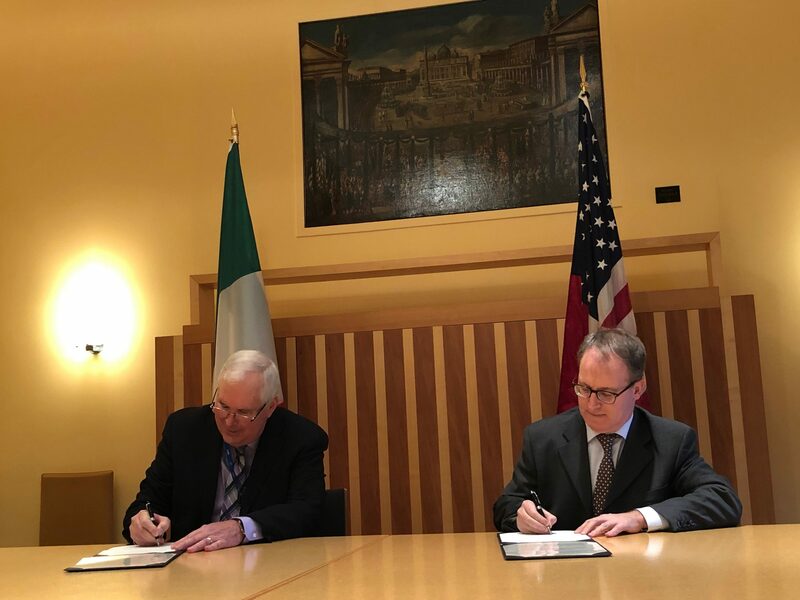 The LBNC writes a report that is delivered to the various funding agencies in countries that are supporting LBNF/DUNE, including the Department of Energy and National Science Foundation in the United States, CERN in Switzerland and the United Kingdom, which recently committed $88 million to the project. “We’re very pleased with the way the project is going,” Lockyer said. The Long-Baseline Neutrino Committee (LBNC) — the experts responsible for advising the Fermilab Director on LBNF’s and DUNE’s scientific, technical, and managerial progress — had an opportunity to gain first-hand impressions of the DUNE Far Detector site during their recent review of the projects, held for the first time at SURF in late October. Josh Willhite, the LBNF Far Site Conventional Facilities Manager, guided many of the attendees on an extensive tour of the 4850 level where pre-excavation activities will begin in the next few months followed by the start of actual rock excavation in 2019. The required clunky jumpsuits, helmets and boots in no way inhibited the group’s nonstop photos, questions and smiles. This review marked a transition in the LBNC’s focus. With the ProtoDUNE designs largely complete and construction underway, and the DUNE Far Detector Technical Proposal and Technical Design Report (TDR) now in the crosshairs, the LBNC is largely turning its attention towards plans for the Far Detector construction. The committee applauded the steady growth in the DUNE Collaboration, which now includes 176 institutions in 31 nations and “a healthy fraction of PhD Students,” and on the “significant progress” in negotiations with new prospective partners in Europe, South America and Asia. 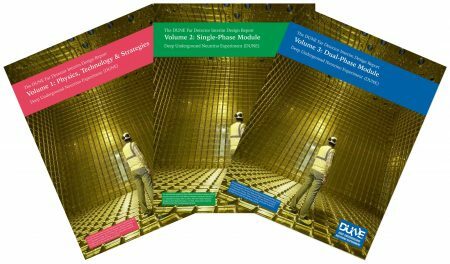 “Overall, the Committee was very impressed by the significant progress achieved by both LBNF and DUNE since the last LBNC review (in June at CERN),” the committee wrote. In particular, on the LBNF side, the LBNC’s report highlighted the completion of the Ross shaft refurbishment, the award of the CM/GC contract, and the imminent start of the final design phase for the Far Site Conventional Facilities. On the DUNE side, they congratulated CERN Neutrino Platform and the Collaboration on the “tremendous progress” made on the ProtoDUNE cryostats. A special Wednesday evening session focused on plans for the Technical Proposal and the TDR. While acknowledging that the plans are “ambitious,” the LBNC agreed with the framework that the DUNE leadership presented, recognizing that such a plan “will allow the Collaboration to maintain full momentum for developing the project in a focused and timely fashion, including the detailed construction strategies and schedules for the various components.” The group discussed the review schedule in accordance with getting final approval in late 2019 to move forward with construction of the cryostats, cryogenic systems, and detector components. Exerpted and adapted from Three Brookhaven Lab Scientists Selected to Receive Early Career Research Program Funding, BNL Newsroom, 15 Aug 2017. 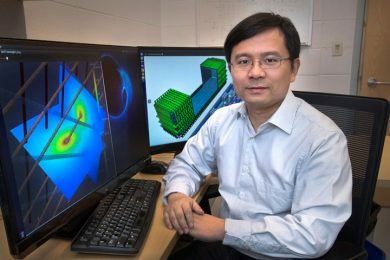 Brookhaven Lab physicist and DUNE collaborator Chao Zhang was selected by DOE’s Office of High Energy Physics to receive funding for a project titled Optimization of Liquid Argon TPCs for Nucleon Decay and Neutrino Physics. Liquid Argon TPCs form the heart of many large-scale particle detectors designed to explore fundamental mysteries in particle physics. Chao’s aim is to optimize the performance of the DUNE far detector LArTPCs to fully realize their potential to track and identify particles in three dimensions, with a particular focus on making them sensitive to rare proton decays. His team at Brookhaven Lab will establish a hardware calibration system to ensure the experiment’s ability to extract subtle signals using specially designed cold electronics that will sit within the detector. They will also develop software to reconstruct the three-dimensional details of complex events, and analyze data collected at a prototype experiment (ProtoDUNE, located at Europe’s CERN laboratory) to verify that these methods are working, before incorporating any needed adjustments into the design of the detectors for DUNE. This article is excerpted and adapted from a Fermilab news article, 14 September 2017. Fermilab’s Alex Himmel expects to spend a large chunk of his career working on the Deep Underground Neutrino Experiment (DUNE), the flagship experiment of the U.S. particle physics community. That is incentive, he says, to lay the groundwork now to ensure its success. 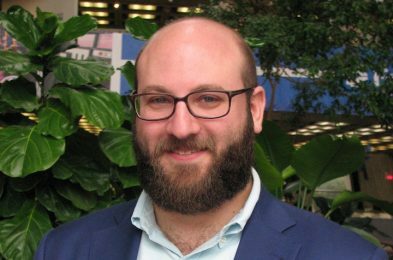 The Department of Energy has selected Himmel, a Wilson fellow, for a 2017 DOE Early Career Research Award to do just that. He will receive $2.5 million over five years to build a team and optimize software that will measure the flashes of ultraviolet light generated in neutrino collisions in a way that will determine the energy of the neutrino more precisely than is currently possible. Photons released from neutrino collisions will arrive at their detectors deteriorated and distorted due to scattering and reflections; the light measured is not the same as what was given off. “What we want to know is, given an amount of energy deposited in the argon, how much light do we see, taking out all the other things we know about how the light moves inside the detector,” he explained. Researchers are already looking forward to the long-term, positive impact of Himmel’s research. Himmel has deep ties with Fermilab and neutrinos, starting with his first job as a summer student at Fermilab when he was 16. In 2012, he won the Universities Research Association Thesis Award for his research on muon antineutrino oscillations at Fermilab’s MINOS experiment. The current theoretical framework that describes elementary particles and their forces, known as the Standard Model, is based on experiments that started in 1897 with the discovery of the electron. 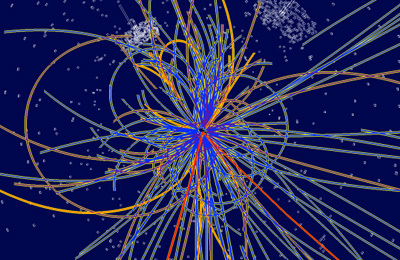 Today, we know that there are six leptons, six quarks, four force carriers and a Higgs boson. Scientists all over the world predicted the existence of these particles and then carried out the experiments that led to their discoveries. Learn all about the who, what, where and when of the discoveries that led to a better understanding of the foundations of our universe. The glow from that light, called the cosmic microwave background, lingers in the sky today. Scientists measure different characteristics of the cosmic microwave background to learn more about what happened in those first moments after the Big Bang. “Dark matter makes up most of the matter in the universe, yet no known particles in the Standard Model [of particle physics] have the properties that it should possess,” says Michael Peskin, a professor of theoretical physics at SLAC.